Organization has always felt like second nature to me, and I assumed everyone knew how to be organized as well. It wasn’t until I became a teacher that I realized being organized doesn’t come naturally to some people. It amazed me how a student’s notebook could be overflowing with papers, but the one paper that was needed was nowhere to be found. It was very frustrating for my students (and myself)! 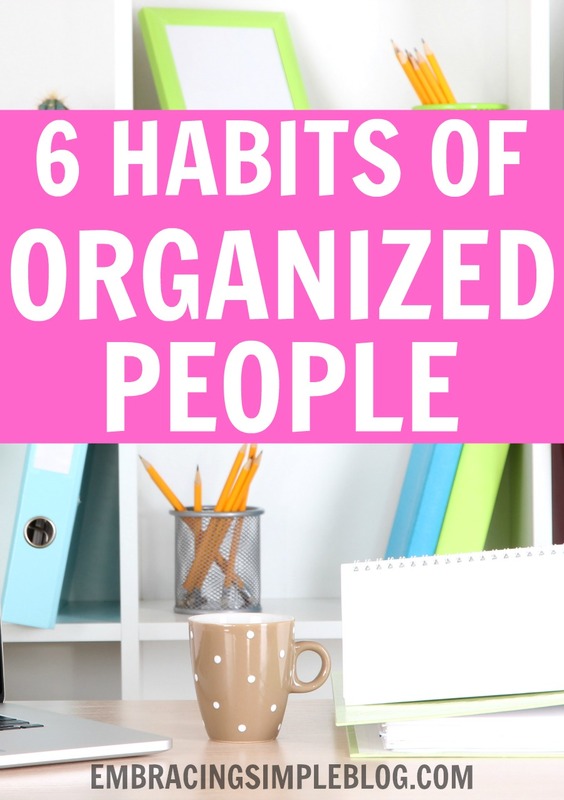 I quickly began teaching my students organizational habits. For several of my students, the methods that I taught seemed to sink in and little by little progress was made. It was fulfilling to see students who started out the year unorganized, ending the year with neat desks and organized notebooks. I learned that anyone can learn organizational habits! Organized people often follow specific habits that help them manage their time effectively and accomplish more. If you feel like you could benefit from some organization in your life, try implementing two or three of the following habits. Once you have tried a few of these habits and have seen progress, begin implementing the other habits as well. The key to staying organized is to be consistent. You must incorporate these habits on a daily basis to see real changes. If most of these habits seem foreign to you, start small so that you don’t become overwhelmed and quit. Change happens a little at a time. The little changes that you make will eventually become habits that will impact your entire life! If you ever feel like you have too much to do, but don’t know where to start, a routine is the answer to your problem! When followed regularly, routines help you focus on what needs to be done rather than wondering what you should do next. Morning routines don’t have to be complicated to be effective. Simply write down everything that you would like to accomplish each morning and how long each task will take. Then decide what you want to accomplish first, second, and so forth. Write everything down in the order that you would like to complete it. After you start following your routine, you may find that you need to adjust it. My morning routine took a couple of weeks for me to get settled into, but I have found one that works well for me. I keep my mornings pretty simple, but I still accomplish several things before 8:00 A.M. My routine includes doing a load of laundry, exercising, eating breakfast, cleaning up the kitchen, getting my son ready, and getting myself showered and ready for the day. By following this routine, I am motivated and ready to tackle the rest of my day. Organized people go through their belongings on a regular basis and donate, throw away, or sell items they no longer need. By having less things to keep track of or shuffle around, you will find that you have more time in your day to do what you really need to get done. Start out small by taking a few minutes to go through one drawer in your kitchen. When you have a few spare minutes another day, declutter and organize another drawer or cabinet until you have gone through the entire kitchen. It may take you a week or two to pare down your kitchen, but that is okay. It doesn’t have to be done all it once. Many times progress happens slowly. Several months ago, I decluttered and reorganized my linen closet. It took me two weeks to finish because I worked on it here and there when I had a few minutes. Even though it took me a while to accomplish, we now have a linen closet that is easy to find things in and very functional. After you have decided on what you want to get rid of, it is important that you actually get rid of those items. They must leave your house! Throw away trash immediately. Take your donations to the thrift store right away. This way the clutter is not staying in your home. While I prepare dinner, I clean up as I go. My spices are in a container on our kitchen counter. As soon as I finish using the spice, I return it to the container. When I finish using a spoon or bowl, I put it in the sink so that after dinner I can rinse it off and put it in the dishwasher. By cleaning up as I go, I have less of a mess to clean up after dinner. When I get my son ready in the mornings, I also clean up his room as I go. Instead of leaving his lotion out on the dresser, I put the lid back on the bottle and return it to the drawer. Rather than leaving his dirty clothes on the floor, they are put in the laundry basket right away. I put his wipes away and throw his dirty diaper out immediately. If I didn’t clean up right away, I would leave behind a big mess that would get in my way later. You could follow the same procedure while you get ready too! Instead of leaving dirty clothes on the bed or in a pile on the floor, put them directly in the hamper. Close the lids to any lotions or soaps that you use and return them to the shelf or basket that they came from. If you clean up as you go, you automatically have a clean space to work with and have avoided clutter and a mess to deal with later. Before you go to bed each night, write a to-do list for the next day. In the morning you won’t have to waste any time thinking about what needs to be done. Your list will help you focus on the tasks that need your attention. This also helps you sleep better at night because your mind won’t be trying to remember all of the things that you need to do the next day. Lists are important for grocery shopping too. Before you go, write out a list of meals for the week then make a list of any items that you need to purchase. This way you are not wandering around the grocery store trying to figure out what to purchase. Having a list also prevents making impulse purchases and buying items that you don’t really need. Just as important as it is to make lists, make sure you take the time to cross finished tasks off of your lists. Crossing items of your list not only helps keep you focused on the next project to tackle, it also provides a sense of accomplishment. At the end of the day you can see all of the things that you were able to finish! Preparation can save you time and frustration. If mornings are crazy at your house, start preparing the night before. One of the best things you can do is lay out your entire outfit for the next day. I even like to plan it down to the accessories and shoes! If you have children (or even a husband) who you are responsible for dressing, get their clothes laid out too. Also, I always pack my husband’s lunch the night before and just stick it in the refrigerator for him to grab the next morning on his way out the door. If your children are in school, take a few minutes before bed to make sure all of their books and folders are in their backpacks and near the front door. That way you don’t have to search for bags in the morning, or worse, forget their homework at home and have to turn around and get them, making your kids late for school. Another time of day that benefits from preparation is making dinner. If you are always waiting until the last minute to figure out what to cook for supper, prepare the night before by setting out all of the ingredients you will need and transferring frozen meat to the refrigerator. By preparing the night before, you won’t have to think about what to make after a long day of work or running errands. When you bring in your mail each day, what do you do with it? If it collects as a pile on your coffee table day after day, your mail has become clutter that you have to work around. Not dealing with the mail right away also causes other problems. There may be bills that need to be paid. If you do not take care of the mail right away, you may end up paying late fees on your bills. Instead of waiting to deal with the mail later, go through it as soon as you bring it inside. When I get the mail each day, I deal with it right away and place it in designated places. If it is junk mail, it automatically goes in the trash. Coupons and ads are placed in a folder on my desk that is specifically labeled “Grocery Ads and Coupons”. Magazines are placed in a basket that I keep for my current reading material. Any bills are opened and placed in a folder on my desk that is labeled “Bills”. By sorting the mail right away, I create less work for myself in the future and avoid creating clutter. The mail is just one example of how dealing with things right away can add order to your life. This principle can be applied to shopping as well. When you get home from the store, put your purchases away as soon as possible. It will take extra effort at first, but in the long run it will save you extra work and frustration. What organizational habits can you add to your day in order to manage your time more effectively? 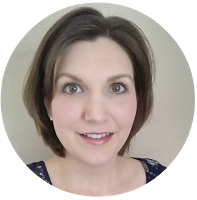 Emily blogs at Queen of the Wilson Household where she shares encouragement about real life. She is a Christian, wife, mom, money saver, and home manager. You can follow her on Pinterest too! I do all of these things and more. I am probably one of the more organized people you could ever meet. I have anxiety and staying organized is what keeps me sane. That is great, Holly! Being organized helps make life so much calmer and easier to manage. I’m glad you know the benefits of organization! #6 is my toughest struggle, but the one that really does matter the most for me. I have a hard time coming back to a problem (especially big ones). It took a long time, but I have figure out that I need to fix things immediately or they never get fixed. Great list! I also swear by calendars. I have 3 with the exact same info on them. One in my phone, one in my purse and one on the door of the pantry. That way everyone in the family can see exactly what we have going on. It really helps cut down on confusion. Then every night before bed I look at the next day and week. It helps keep upcoming events in my mind. We have had a lot less stress this way! Yes, dealing with things right away can seem daunting, but it is always better to fix the situation before it becomes a bigger issue. Calendars are a great way to stay organized. I love that you keep one on the pantry door for your whole family to see! Out of all these my favorite is to clean up as I go. I can’t stand a mess! Me too, Jamie! I can always get more accomplished when the area I’m working in is clutter free! Cleaning up as you go helps so much! With our house on the market we’ve been doing that so much more and I really need to continue that habit always. While the house doesn’t need to be spotless, having less mess around really helps my stress levels be lower! I agree, Alexandra. It is almost impossible to have a spotless house especially with kids, but we can all work on having less mess. Good luck with your house selling! Great tips. I totally agree with the declutter tip. I found that I have just too much stuff. Everyday, I try to get rid of at least 5 items. It really helps clear my mind as well as keep me sane and more organized. That is great that you get rid of items on a daily basis. I think many of us have way more items than we really need. Staying clutter free has a positive impact on so many areas of our lives! Decluttering on a regular basis has really helped me to get—and stay—organized. As they say, organized clutter is still clutter. It is so much easier to see, sort, and appreciate what you have when the clutter has been removed and you are left with the things that provide value to you. I am always looking around me for things that have outlived their usefulness in our lives. I collect them in a box, and when the box is full, it is sent to be donated. Jennifer, you are right! We should only be keeping items that provide value. I fill up a box of donations too. The DAV comes by once a month and picks up my box of items that I have collected. It always feels good to get those items out of my house! I’m a big advocate of preparing the night before. I feel that your morning sets the pace and attitude for the remainder of the day! Yes, by preparing the night before, there are less decisions that have to be made and less running around. This helps make the mornings enjoyable and calm! These are amazing! I feel like I am this type of person too–being organized helps keep my anxiety level down! Me too, Heather. When there is clutter everywhere, I start to feel stressed! Good for you, Whitney! I know you love to organize! Now that we have been in our house for over a year, I’m working on doing some major decluttering too and getting rid of the items that just don’t work in this house. I have every one of these qualities. I can’t have a messy desk, I can’t think or concentrate with papers everywhere. I’m so glad you know the benefits of being organized, Cori! Having a mess free space can make such a difference in the amount of work that I am able to accomplish and helps me focus on the task at hand. Lisa, I love your specific examples of things that can be done every day to keep the house (and life) clean and organized. I used to do all of my cleaning on the weekends, but a few years ago I started spreading it out during the week like you do. It is much easier to handle it all in smaller chunks rather than tackling huge tasks, like doing a load of laundry everyday instead of all the laundry once a week. Thanks for sharing what works for you and your family! Becoming more organized might be my highest priority for 2016! With wanting to be more fit, healthy, and happy – organizing is a huge part! Huge supporter of: Routines, List, and Preparing! Great post to get back on track for the new year! Thank you so much, Alexandra! I wish you the best in accomplishing your goals in 2016! A little preparation can make all the difference. My morning routine has helped me stay healthy because because I’m accustomed to exercising as part of my routine every weekday.